This is the kind of pie that you can use as leverage to get things done around the house. The other day when I made this, my kids were all standing around drooling and waiting for the moment that they could devour their slice. They whined when I told them that they were going to have to wait till after dinner to eat it. It ended up working out great for me because during dinner I only had to tell them once that if they didn’t finish their food they wouldn’t get any pie. I have even considered making it every day just so I can get them to cooperate a little bit better when it comes time for homework, cleaning their room, and getting along with one another. The chocolate mousse in this recipe is very simple to make. I use it in a lot of other recipes. You can even serve it alone in cute little single service dishes with a swirl of whipped cream on top and a few chocolate shavings. There are five things you need to know before you make it. The first step for the mousse is to make the chocolate ganache. 1.Make sure that you use a good quality chocolate chip. If you don’t, you will end up with a grainy mousse. 2.You can not substitute milk chocolate chips for the semi sweet chocolate chips. With the milk chocolate the flavor will not be as pronounced. 3. Make sure that the ganache is completely chilled before you go try to whip in the whipping cream. If it is not chilled, the mousse will not whip up as full and fluffy. 4. You have to use heavy whipping cream. I know it is more expensive than the regular whipping cream, but you really get what you pay for. The heavy whipping cream whips up thicker and has more stability than just the regular whipping cream. Most professional bakeries and restaurants only use heavy whipping cream. 5. The pie will set up better and be a lot more stable if you let it sit in the fridge for a few hours before serving. Okay, lets move on to the recipe shall we? 1. Place the semi-sweet chocolate chips in a large heat proof bowl. 2. Bring one cup of heavy cream to a simmer in a small sauce pan. 3. Pour the hot heavy cream over the chocolate chips. Let it sit for about 3 minutes and then mix until thick and well combined. Don’t stress at first if it seems like it is not coming together. Be patient and keep stirring. 4. Place the ganache in the fridge until completely chilled. About 1 to 2 hours. 5. Once the ganache is completely chilled, add two cups of heavy cream to the ganache. With a mixer, whip the cream and ganache together until stiff peaks form. 6. In a separate medium-sized bowl, whip the remaining 2 cups of heavy cream, granulated sugar, and vanilla extract until it forms stiff peaks. 7. Spoon the chocolate mousse into the prepared pie shell. Swirl the heavy cream on top of the chocolate mousse. 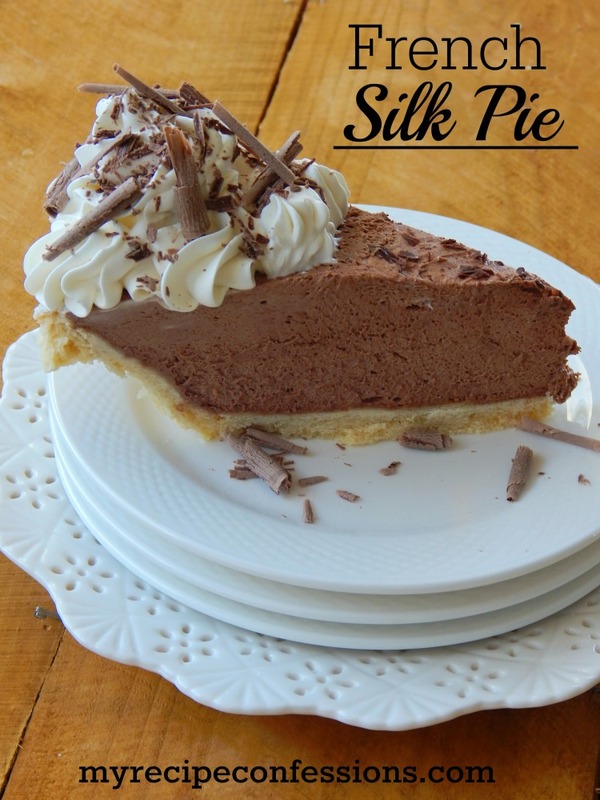 Place the French Silk pie into the refrigerator and let it chill for 2 to 3 hours. I’m planning to make this pie for Thanksgiving but due to my schedule will need to make it the day before. Will the pie still be good the next day? Is there anything different I should do for this? Yes. the pie will still be good if you make it the day ahead. So I am wondering if it is normal when you mix the ganache and cream together for it to get kind of stiff and then soft again before the stiff peaks happen?? It almost looks like its lumpy. The only thing I can think of is maybe the ganache is too cold and it is making the cream seize up. I have never had that happen before. Did it end up working out? I am trying it again today. I never did get it to whip up. And you do whip the ganache and cream together? Are they both cold when you add them together? I’m a little confused, I thought to make a ganache you use heavy cream and chocolate not heavy whipping cream. You are right, it is heavy cream. I am fixed the typo in the recipe. Thanks for bringing it to my attention. Ok Carrie- I know this is a dumb question, I usually just do it to taste, but since it’s Thanksgiving, I want it just right. When I make the French Silk pie, how much sugar should I add to the remaining 2 cups of whipping cream? And should I add vanilla? And there’s no sugar added to the filling, right? Just the ganache and cream? Wow, I’m sorry to be so needy! You are not needy! That should have been in the recipe. I totally over looked that. I just updated the recipe. Add 1/4 cup of granulated sugar and 1 tsp. of vanilla to the cream for the top. Happy Thanksgiving! I’m going to make this today for Thanksgiving! Quick question, is it 12 or 16 ounces of chocolate chips? It is a 11.5 oz. package of semi sweet chocolate chips. Have a great Thanksgiving! 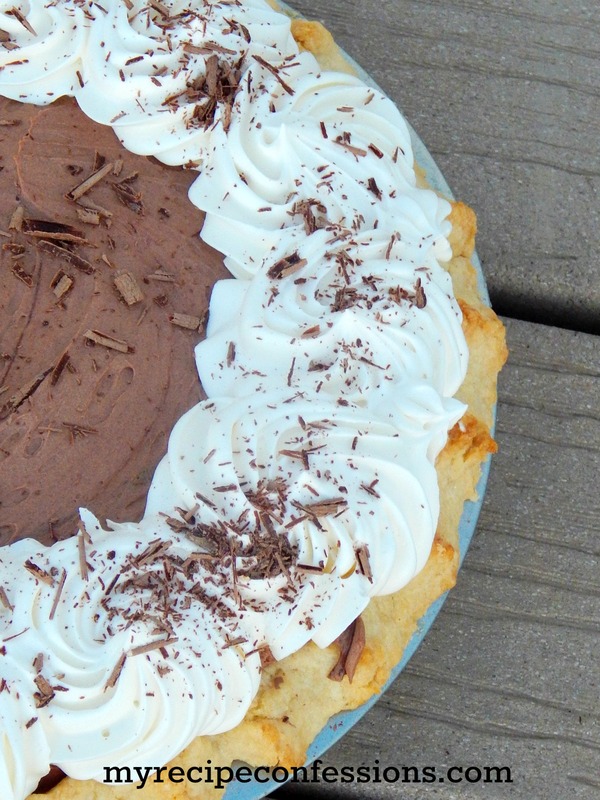 The chocolate mousse in this pie is very versatile. You can use it as a filling or frosting on cakes or cupcakes. Around Christmas I like to use peppermint extract instead of vanilla and pipe it on top of chocolate cupcakes. The sky is the limit with this stuff! I for sure will be back to Best of the Weekend. Thanks for stopping by!